Many sailing charter customers today prefer catamaran sailboats over mono-haul sailboats for many reasons. When deciding on our next vacation in Key West, you may want to consider a catamaran sailing charter. Many catamaran sailing charter customers are willing to sacrifice the speed of a mono-haul sailboat to that of a catamaran sailboat. Below you will find the seven most popular reasons sailing charter customers choose a catamaran sailing charter for their next Key West, Florida vacation. Catamaran’s are larger, wider, and have more space inside as well as outside than any other style of sailboat. When choosing a catamaran sailing charter in Key West, charter customers want ample deck space, more beds and bedrooms to accompany more people. Most of our catamaran’s in Key West can take up to 12 people on a day sail and as many as 55 people on Argo Navis. 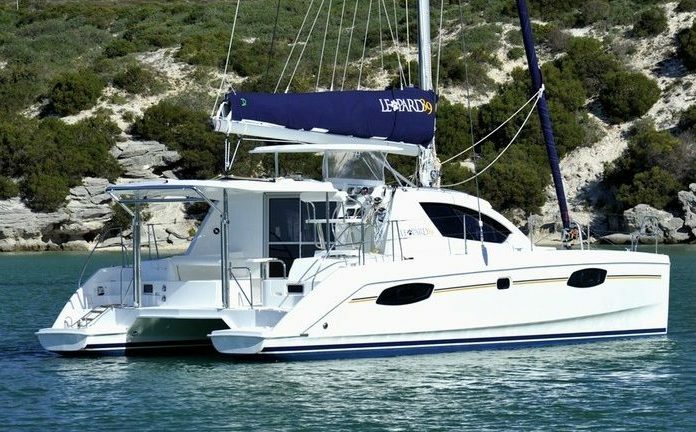 On an overnight charter Blue Ocean Yacht Charters has catamaran rentals for up to 10 people. If your vacation rental is more than 10 people, then I would recommend you charter two yachts at the same time. Many yacht charter customers prefer a level sailing boat. This gives ease to walking around and socializing. Furthermore, the catamaran does not need its catamaran rental customers to balance the heeling that takes place with a traditional mono-haul yacht. For luxury and level sailing, choose a catamaran on your next yacht charter in Key West. A sailing catamaran has a large, well-lit Galley that is surrounded by windows for views and increased natural lighting. The larger galley makes it comfortable to be inside the catamaran while on the sailing charter. A larger Galley means a larger kitchen to gather all your friends in at the same place to dine and socialize. All catamarans on a sailing charter in Key West have trampolines. The catamaran’s trampoline is a great place to jump around and have fun. Furthermore, the trampoline, makes a great place for lounging, listening to the water breaking underneath you while on the sailing charter. The trampoline allows water to break through it giving the catamaran a smoother and more enjoyable ride while on charter. Catamaran sailing boats have more bedrooms and beds allowing the charter customer to bring more friends and family on a sailing charter in Key West. Many of our catamarans at Blue Ocean Yacht Charters in Key West have three or more estate suites with each having its own private bathroom. Most of our sailing catamarans in Key West have a table that folds down in the galley to sleep an additional two adults. Catamaran sailboats have more seating areas outside so you and your charter guests can take in the beautiful views of your sailing charter. All of our catamarans have large outdoor seating areas in the cockpit, located in the rear of the yacht. Our Leopard 44 even has additional shaded seating in front of the catamaran as well as the back of the boat. A catamaran is mostly popular for its lower draft, giving it the ability to go to shallower places that most other boats can’t go. This allows catamaran sailing charterers the ability to get closer to land masses and other hard to get to places. A shallow draft also decreases risk of damage to the catamaran from running aground.